Coldplay frontman Chris Martin will be channeling England's Glastonbury festival when he takes the stage at America's Super Bowl this weekend (07Feb16). Martin and his bandmates will headline the half-time show at the big football game, and during a press conference on Thursday (04Feb16), the singer revealed their set will invoke a sense of home, with inspiration coming from the long-running British music festival. 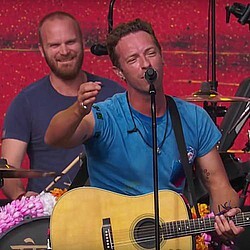 "One of our favourite places to play in the world is a place called Glastonbury festival, which is a big music festival that happens in England," Martin explained. "It's full of colour and pageantry, and it's an amazing sort of spiritual home of music in England. "We wanted to bring that sort of vibe to the Super Bowl half-time show. We can't compete with amazing dance routines and all of that. We have to try to do what comes naturally to us, which is to try and provide a bit of fun and a great atmosphere for people to come and be together and be communal and enjoy the general experience." Martin added they will share the stage with the Youth Orchestra of Los Angeles, and they'll "honour the past" by teaming up with Beyonce, who headlined the Super Bowl spectacular in 2013. When asked how he lured his close friend to join him onstage, Martin joked, "I said 'Hey Queen Bey! I want you in a red bodysuit!' Because it's Super Bowl 50!" Reports suggest 2014's Super Bowl headliner Bruno Mars will also join the band onstage at Levi's Stadium in Santa Clara, California.